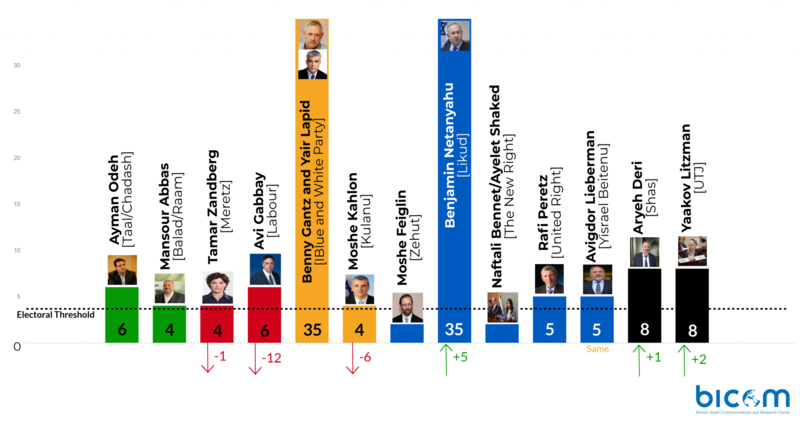 Bibi wins, Bennett flops, will Gantz stick around? In the final phase of the election campaign Benjamin Netanyahu cleared the hurdles in his path like an aggressive racehorse, full of energy and kicking out at his opponents. This was a hard campaign for Netanyahu – fought under a cloud of corruption charges facing his most formidable opponent – but it led to perhaps his sweetest victory. A fourth consecutive term in office secured with more seats and more votes than he has won before – 1.14 million votes, 26.4 per cent of the vote, compared to 985,000 votes and 23.4 per cent in 2015. In this bizarre election Bibi and Gantz fought it out to a dead heat with each party winning 35 seats. 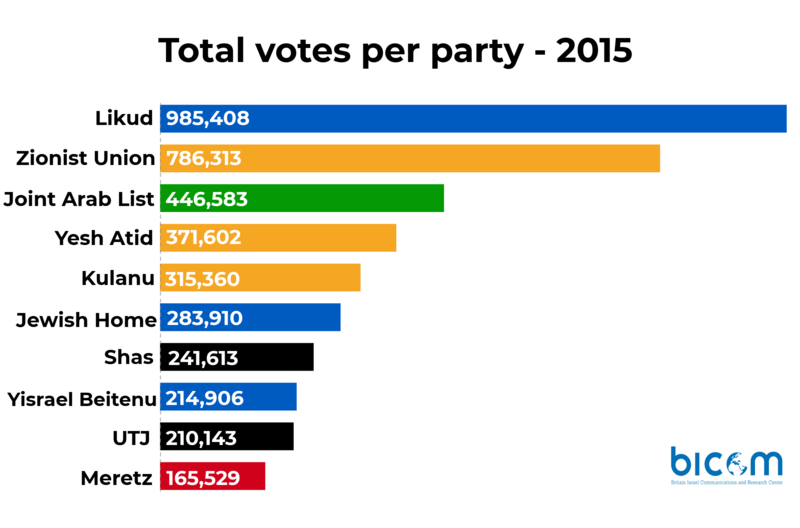 Bibi edged ahead of Gantz by just 14,000 votes and due to the strength of his allies from the 2015 coalition will form a Government with a 65-seat majority. It was clear from the start that the campaign was polarised between those who want Bibi to lead them and those who want him to go. As Gantz sought to attract voters by framing his party as a movement to oust the Prime Minister, Netanyahu rallied support by framing his campaign as a last-ditch fight to save his right-wing Government. This led to a result, not seen for many years in Israel, where just two parties hold 70 seats in the 120-member Knesset. The big parties hoovered up support from the smaller parties on the right and the centre and left. 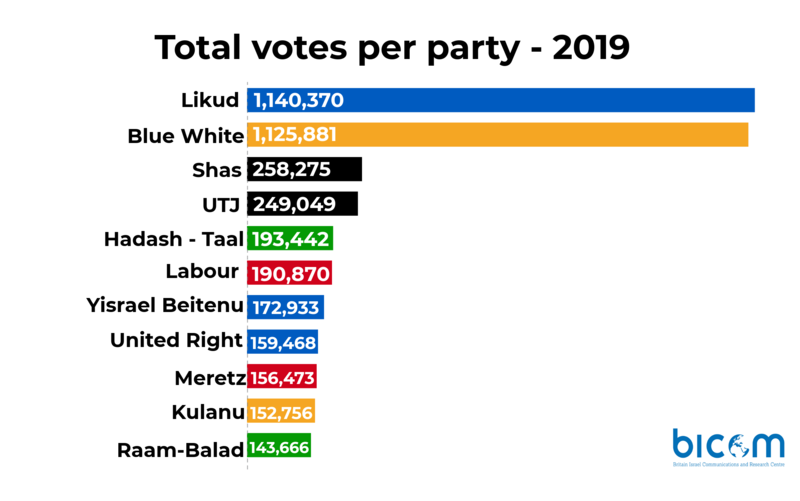 An initial analysis suggests Gantz took voters away from Labour and Kulanu and Netanyahu took voters away from the United Right, the New Right and Yisrael Beitenu. But to win Gantz needed to prise voters from Likud but didn’t succeed, which is why he lost. Arguably he failed because he never set out a compelling vision of what he stood for and what he would do in office. His party left voters confused as to whether he was Likud light, Bibi’s policies without the divisive politics and corruption, or something completely different. The Gantz surge was still impressive. A party pulled together just a few months ago won 1.12 million votes, 26.1 per cent of the vote. In 2015 the centre left bloc of Yesh Atid and Zionist Union (Labour and Tnua) won 35 seats, 27.4 per cent of the vote and 1.16 million votes. In this election, Blue and White and Labour won in total 41 seats, 30.5 per cent of the vote and 1.32 million votes. Netanyahu’s last-minute ploy for right wing votes sent his rival Naftali Bennett into the political wilderness. Bennett and Shaked’s downfall was one of the big surprises of the election but the margins were tiny, they lost out by just 1500 votes. Not content with a solid power base in the Jewish Home party, they sought to build a bigger party and attract secular right-wing voters. But for a successful entrepreneur and businessman, Bennett made a huge mistake. He misread the size of the market, rebranding his product only for a chunk of his loyal customers to desert him and opt for the original. Netanyahu’s gambit also weakened the parties who will serve in his coalition. The United Right party won 5 seats from 159,000 votes. 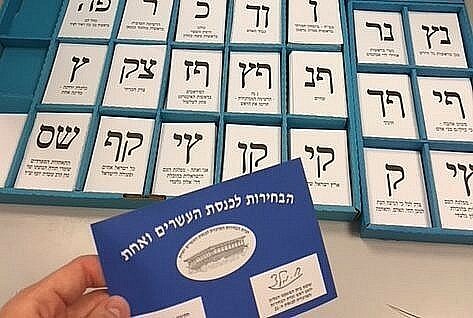 In 2015 Jewish Home won 8 seats with 283,000 votes. Yisrael Beitenu won 5 seats with 173,000 votes but in 2015 won 6 seats with 214,000 votes. Support for Kulanu tanked from 10 seats in 2015 and 315,000 votes down to 4 seats and 152,000 votes in this election. The Arab parties were hit hard by low turnout and the fallout from the break-up of the Joint Arab List. In 2015 the Joint List won 13 seats with 446,000 votes. 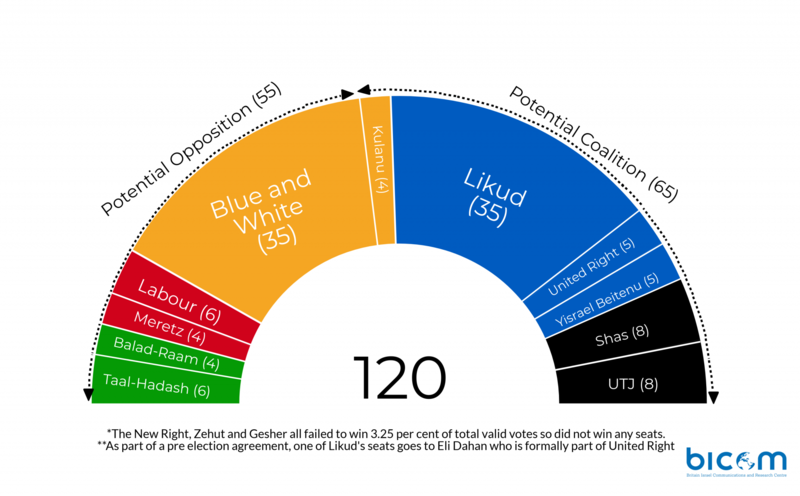 In this election the two Arab parties, Hadash-Ta’al and United Arab List – Balad won a total of 10 seats with 337,000 votes. 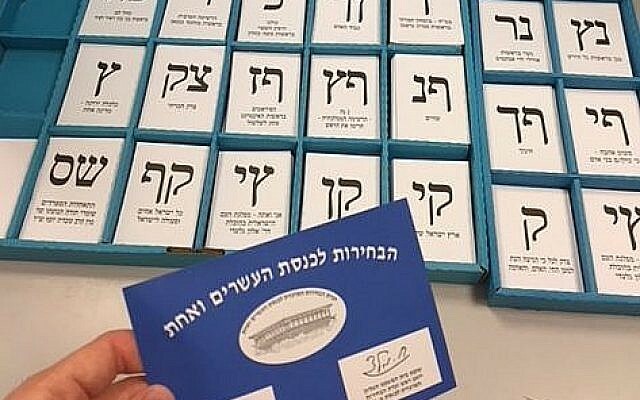 By contrast the ultra-orthodox parties, Shas and United Torah Judaism, increased their seats from 7 and 6 in 2015 to 8 each in this election while receiving only 17,000 and 38,000 extra votes. But the prize for the biggest loser of this election is Labour. The once dominant party that led every Government from 1948 to 1977 saw its seats reduced from 18 to just 6 and is now the sixth largest party. Avi Gabbay was a strange choice for Labour leader having served as a minister under Netanyahu, formerly part of Kulanu and never a Labour member. He personified Labour’s identity crisis and will be remembered for poorly managing the latest phase in its slow decline. With his majority assured, Netanyahu will now begin the process of intensive coalition negotiations. Avigdor Lieberman has said he would rather a new election or joining the opposition to conceding on the new law to expand conscription of ultra-orthodox students, the issue that contributed to the break-up of the last Government in December 2018. He has also demanded the defence ministry and will push for a more aggressive approach to Hamas in Gaza, just as Netanyahu has quietly reached an understanding to defuse violence on the Gaza border. The ultra-orthodox parties have joined up with the United Right to present a unified position on conscription and maintaining the orthodox status quo at the Western Wall, to the detriment of non-orthodox Jewish denominations who happen to form the bulk of US Jewry. Netanyahu’s overriding priority is self-preservation. His mission now is to bind in his new coalition partners with top jobs and policy promises so they support him after the Attorney-General formally recommends that he be indicted later this year. He might also offer his Likud colleagues better jobs than in previous governments to keep them on side. The Justice ministry will be a pivotal post as moves are made to either grant Bibi immunity under existing rules, or introduce a new law. As the Prime Minister’s corruption case advances, the Justice minister will be in a tight spot if Netanyahu continues his campaign to question the motivation and independence of state prosecutors. The Prime Minister will either choose an experienced, cautious minister who will carefully manage that relationship, or go for broke and choose a hawk opposed to judicial activism who will shake up the justice system. Finally, what next for Benny Gantz? He has pledged to be a thorn in Bibi’s side, pursuing more corruption cases, calling for a commission of inquiry and making life unpleasant for the Government. The Blue White party was an artificial construct of three parties and four men with very different views. Will it break up, or grow stronger? Gantz wanted to be Prime Minister not opposition leader. In any normal election cycle, he would be heading for the exit. But this is not a normal situation and whatever Netanyahu might wish, the fact remains he may soon be the defendant in a complex criminal trial. Gantz knows he might get another shot at the top job, the real question is whether he still wants it. 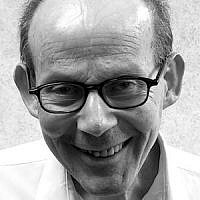 James Sorene is CEO of the Britain Israel Communications and Research Centre in London and an analyst of Middle East Issues. 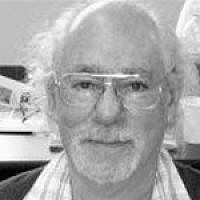 He appears regularly on UK TV and Radio and writes for numerous newspapers and websites. 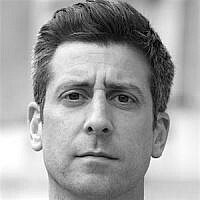 He was previously a UK Government civil servant, Head of Communications for Deputy Prime Minister Nick Clegg from 2011 to May 2015. From 1997 to 2000 he was Head of Public Affairs at the Israeli Embassy in London.